The Misfit Cosmetics Wake Up Wipes are designed to help you look more awake and feel less sleepy. 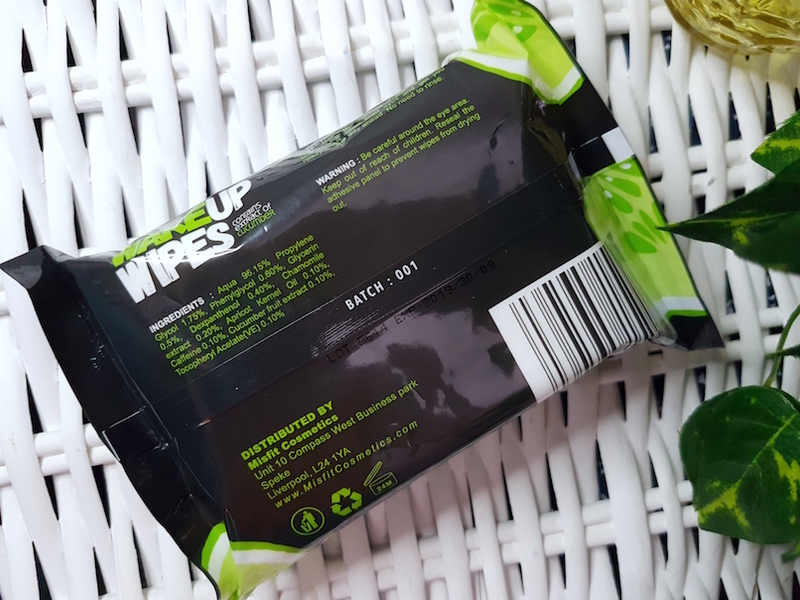 Packed with caffeine and cucumber, the cooling wipes work to refresh your skin in a snap, also working on dark circles, puffiness and red blotches. The wipes can also be used to remove makeup at the end of the day. 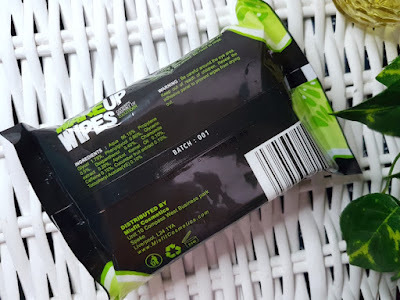 They come as a pack of 25 wipes that are packaged in a black, green and white plastic pack with a sticker flap opening. Size wise, they’re about an average baby-wipe size. They’re large enough to clean your face thoroughly and easily with just one wipe rather than multiple. To use, grab a wipe and use it to massage and wipe across the entire face and neck, including eyes. They have a lovely smell of cucumber to them that smells fresh and rejuvenating which is nice when you're tired. They’re a very quick and easy way of waking up in the morning, and they really do help the skin to look more awake after use. 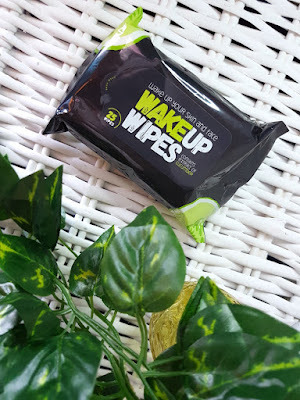 When using the wipes first thing in the morning, I do feel like it helps to wake you up a bit and it refreshes your skin, adding a brightness to it. They don’t leave your face feeling oily/greasy or dry, so I’d say that they are good for all skin types and the skin does feel clean. I wouldn’t use these to fully replace my regular cleansing routine, but I definitely love them as an extra. These would be perfect to take away to a festival or for travelling to help rejuvenate your skin as you go. They’d also be great to keep in the car or your handbag for hot summer days. Alternatively, they’re also fab to have to hand when you just don’t have the energy. Think hangovers, or when you’re unwell. These are so much easier to use than trying to complete your regular routine on a bad day. I haven’t tried them as makeup removal wipes, so I can’t comment on that, but I do really love them for their main purpose of helping to wake up your skin. For the price that they are available for as I post this as well, they are a total bargain. Definitely go grab a few packs and keep them handy! Especially whilst we're going through the summer heatwave. 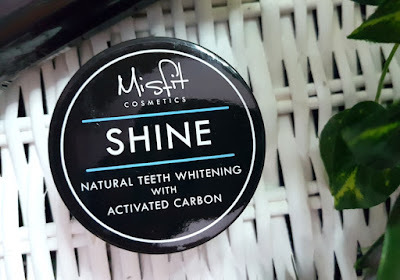 The Misfit Cosmetics Activated Charcoal Teeth Whitening Powder is a hard working, vegan friendly and cruelty free teeth whitener and stain remover. 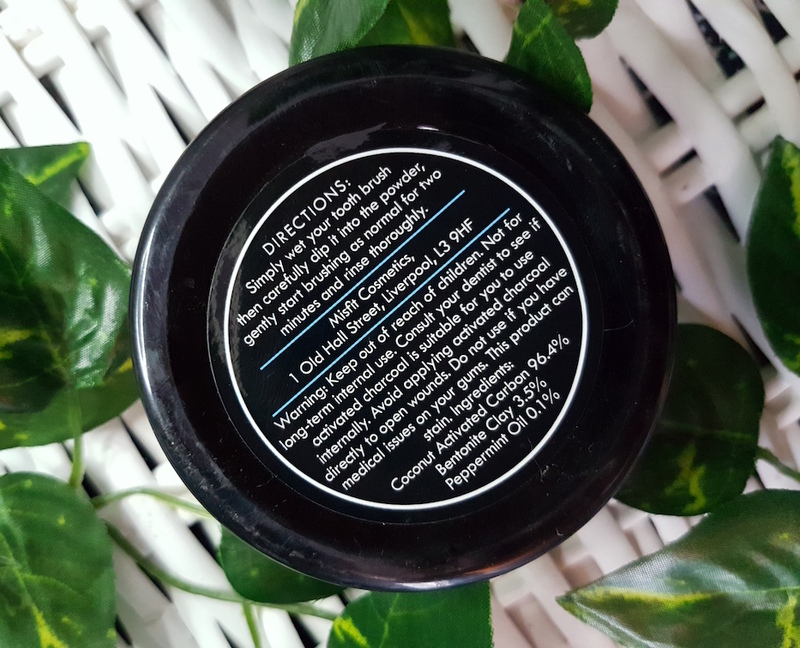 It is made up of Activated Charcoal, Bentonite Clay, Peppermint Oil, and nothing else. The charcoal works to scrub stains away from your teeth, absorb plaque and it also helps to prevent bacteria growth in the mouth. As well as being a vegan friendly and cruelty free, Misfit Cosmetics also promise that this powder doesn’t cause sensitivity, is peroxide free and is made using only natural ingredients. To use, you need to wet your toothbrush and dip it into the Activated Charcoal Teeth Whitening Powder, Tap off excess and then brush your teeth with it for 2 minutes. Follow up by rinsing and/or using regular toothpaste afterwards. I’ll make this clear from the offset: before you use this, do make sure that you’re prepared to clean either as you go or straight after. It’s gonna get messy! I keep a cloth next to me to wipe up splashes as I go that get around the sink. Also, open the pot veeeeery carefully. When getting this on surfaces like porcelain it is easy to remove with a bit of water, but on fabrics or carpets it’s a little harder. Not impossible, but harder. Due to the mess, I find it safer to use it at night rather than in the morning as I find that my sluggish, morning-tired self tends to make more mess with it and therefore I need to spend more time cleaning it up as I go. When you’re in a rush in the morning it can be a bit annoying, so for me, night time it is. When using, it looks like you’re brushing with dark black ink. It can be really unnerving the first couple of times you use it, and it can even look a bit like you have no teeth, instead just a black hole for a mouth! The formula does contain peppermint oil but you don’t really taste it too much. It also doesn’t taste bad though, it just doesn’t really taste of anything. It’s like you’re brushing your teeth with black water. 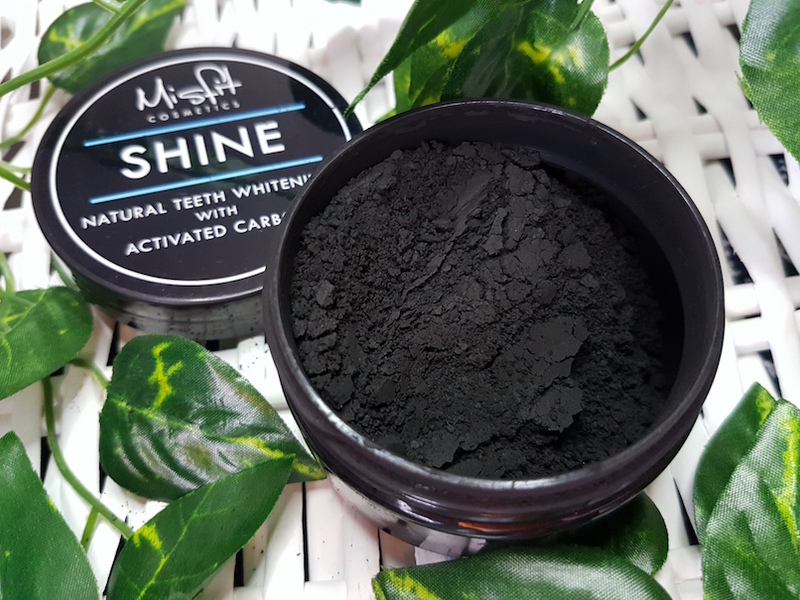 Putting the mess and fun aside though, I am so in love with this Activated Charcoal Teeth Whitening Powder. 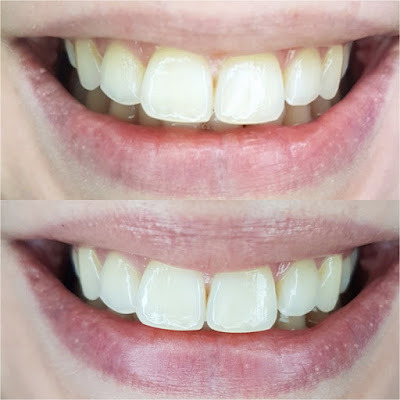 After just one use your teeth already feel so clean, exactly like when you’ve had a scale and polish at the dentist (but with far less discomfort). It does such a great job removing stains, too. I drink a LOT of tea, and the back of my teeth can get a bit stained from that. It’s not something I was able to photograph though due to really awkward angles etc, but I can tell you that the stains have decreased greatly thanks to this. I don't think my results are overly extreme as I recently went through a teeth whitening treatment (which I reviewed a short while back), but you can see how well it has worked on the stains around the top of my teeth and how they look so much cleaner on the after photo. Even after using this only twice I was already receiving comments about how my teeth were looking whiter. The main thing I do love about this stuff though is just how great my teeth feel. They’re so clean constantly, and keeping my teeth clean is something I focus a lot on. If you’re the same, you may want to check this out. I do find that it can stain the gums a bit after use, but only temporarily. You can easily remove it by brushing your teeth straight afterwards or by rinsing your mouth well. I recommend this Activated Charcoal Teeth Whitening Powder wholeheartedly, and I only reduced the score below by one point purely for the mess you can get into when using it. If you’re after whiter teeth, this is definitely one of the quicker and easier solutions, it’s just very messy. 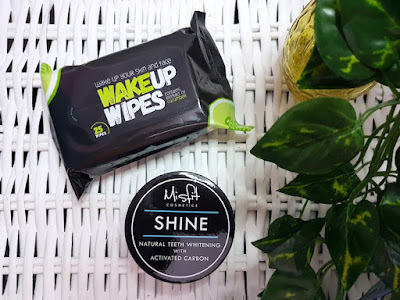 You can purchase the Misfit Cosmetics Wake Up Wipes and Activated Charcoal Teeth Whitening Powder from Misfit Cosmetics. What are your thoughts on the Misfit Cosmetics Wake Up Wipes and the Activated Charcoal Teeth Whitening Powder? What are your favourite skincare wipes and teeth whitening treatments? *These products were sent to me to sample as review considerations. However, this hasn't in any way affected my review with all thoughts and feelings about the products and company being 100% my own.